Vice-Admiral Mark Norman arrives at the courthouse, in Ottawa, on Jan. 29, 2019. 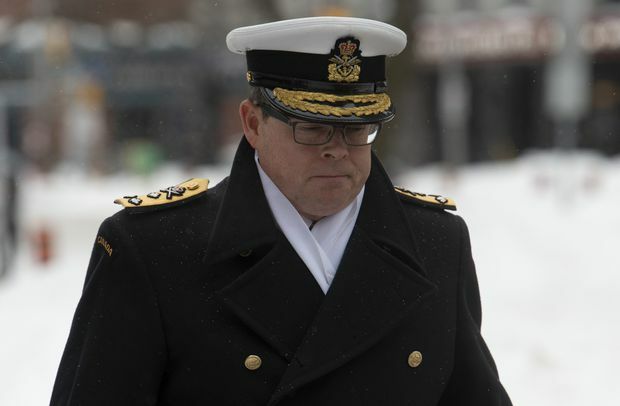 Vice-Admiral Mark Norman’s defence lawyers told an Ottawa court that some military officials have used code names to hide information about him that pertains to his court case. Marie Henein and Christine Mainville ­­presented a document they obtained under Access to Information in court Tuesday afternoon that shows in internal correspondence related to Vice-Adm. Norman and his case that he was referred to as: Kracken, The Boss, C34, MN3, among other pseudonyms, by officials within the Department of National Defence. Vice-Adm. Norman was suspended as the military’s second-in-command in January, 2017 and charged last year with one count of breach of trust for allegedly leaking government secrets in an attempt to influence cabinet’s decision on a shipbuilding contract with Quebec’s Davie shipyard. His pretrial resumed in Ottawa Tuesday morning and is scheduled for three days of hearings. Vice-Adm. Norman’s lawyers have been trying to obtain thousands of government documents they believe will exonerate him. They argue the use of code names and other identifiers in internal exchanges will hinder their ability to retrieve those documents. The document uncovered by his legal team comes one month after a witness, whose name is protected by a publication ban, alleged the Department of National Defence used code names that would effectively make records invisible to anyone looking for them, including Vice-Adm. Norman’s lawyers. “This is not out of thin air. We called a witness who said there was some belief there were code names,” Ms. Henein said. Ms. Henein and Ms. Mainville spent most of Tuesday questioning Patsy Bradley, a paralegal with the Department of Justice, about the government’s efforts in searching for and retaining the documents they say are necessary for Vice-Adm. Norman to have a fair trial. Ms. Bradley, when questioned by Ms. Mainville, said code names were not used to search for documents, but she also said she doesn’t think government departments need to use code names to conduct searches, saying records relating to his charge of breach of trust can be captured with other search terms. Mr. MacKinnon, the Justice Department lawyer, said repeatedly that documents are still being retrieved. “The machinery of government has a lot more resources than we do and we are doing everything we can, truly your honour, to try and focus and to try to get to the bottom of this – it is like a spider’s web,” Ms. Henein said. The court also heard from a lawyer representing former Treasury Board president and Nova Scotia MP Scott Brison, who applied for standing in the case. Vice-Adm. Norman’s lawyers have alleged Mr. Brison, who raised questions about the shipbuilding contract with Davie and led the effort to review the contract, was acting on behalf of Halifax-based Irving Shipbuilding. Defence chief General Jonathan Vance is expected to appear before court Wednesday morning, and is likely to face questions about whether military officials intentionally avoided using Vice-Adm. Norman’s name in correspondence and about instructions he gave to military officers.